As energy rates continue to rise and we await the introduction of domestic water rates online retailer Purchase.ie have announced they are launching corporate energy saving and water conservation days to help educate employees on how they can save money. A 2012 Green Awards Finalist, Purchase.ie specialise in the sales of products which can help to people save money on their domestic bills. The online shop includes sections on energy saving products, water saving products, waste management products, eco gift ideas and even a dedicated section on Irish products. “All the major energy suppliers have increased energy rates dramatically over the past two years and this pattern is likely to continue” according to Colm Griffin of Purchase.ie. “Domestic water charges will be upon us also shortly so it is a good time for people to start thinking outside the box and investing in products which can save them money in the long-run”. 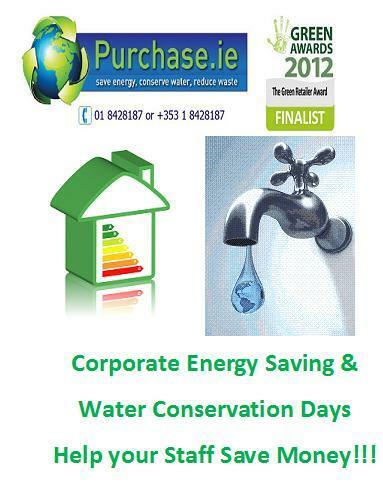 Purchase.ie intend running Energy Saving and Water Conservation Days at companies throughout Ireland and explain how a wide range of products work and how they can help to save on their domestic bills. “Any company that invites us to run an event on their premises will be rewarded as we will be offering discount prices on our product range to all their staff. Therefore not only will the staff learn how to reduce bills they will also get products which can help them to do this at bargain prices” Griffin added.